Whilst spring never really showed up this year, summer arrived with a bang at the beginning of July and doesn’t look set to end any time soon. The reliable good weather has been ideal for landscape photography, especially at sunrise. After all, it’s a little less painful to set the alarm for 5.30am when you’re confident that you’ll be rewarded with clear conditions. 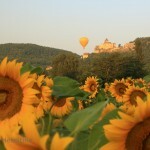 The French countryside has an abundance of natural beauty. 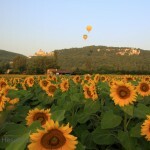 Decorated by chateaux, old villages, farms and endless fields of hay bales, corn or sunflowers, it is easily recognisable to anyone who has travelled through France by car or spent time watching the Tour de France. 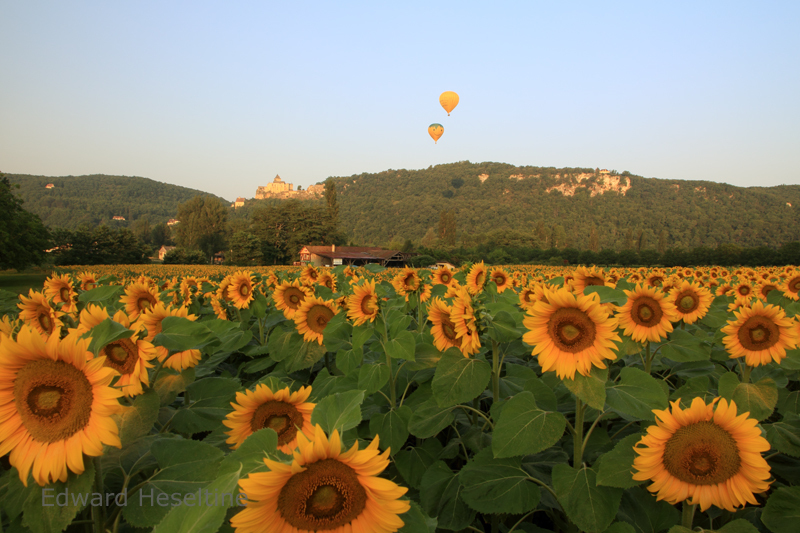 The Périgord Noir area of the Dordogne has more than its fair share of all of the above and is a great place to attempt a great landscape photograph. This week is all about my endeavour to do just that. 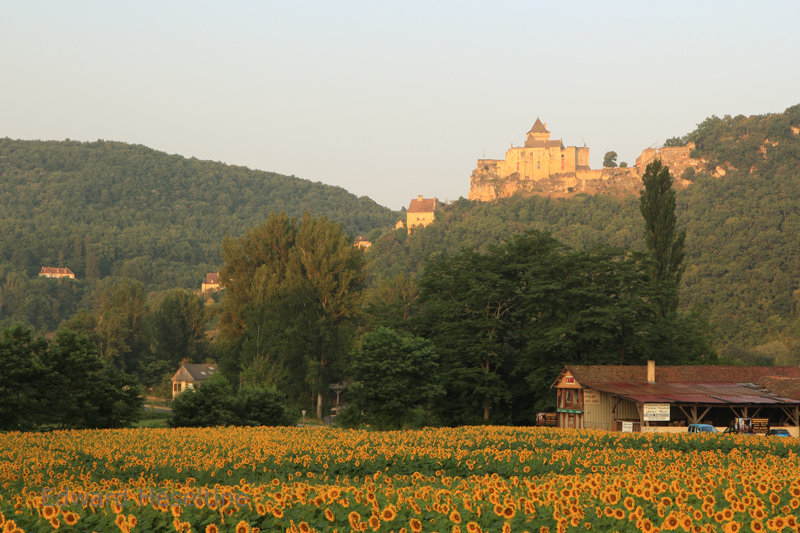 Having scouted out a good looking field of sunflowers with a chateau in the backgroud that was facing the right direction for beautifully soft ‘golden hour‘ light, I set the alarm and went to bed. Managing to wake up when the alarm went off and drag myself out of bed at 5.30 was step one achieved (not always a given). 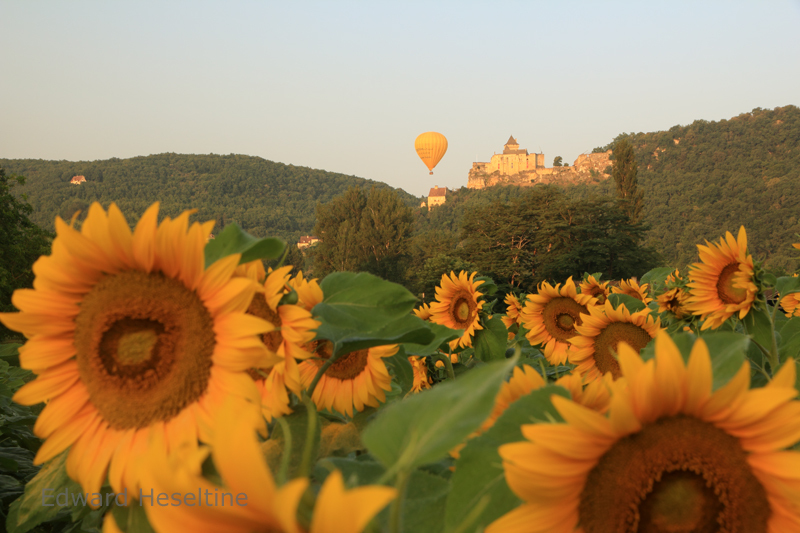 I arrived at my location beneath the Chateau de Castelnaud, set up the camera for the following composition and started taking photos. 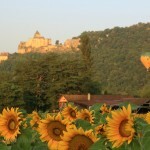 I took a lot of images using this composition as the sun rose above the horizon and the light on the chateau improved. It’s a nice image and I was reasonably happy with the results. However, looking at it on the back of the camera, I decided I wanted something more dramatic so moved forward to find a different composition. 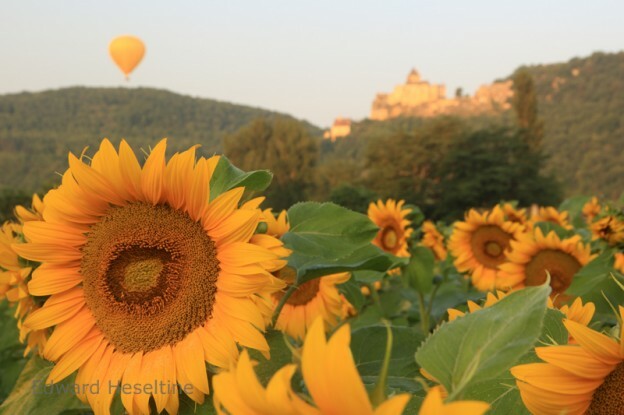 Getting closer to the field of sunflowers increased their relative size in the frame and gives the viewer the feeling of being surrounded by these beautiful plants as well as revealing the details of the flower heads. Getting lower down has also eliminated the building and minimised the presence of the trees thanks to perspective. 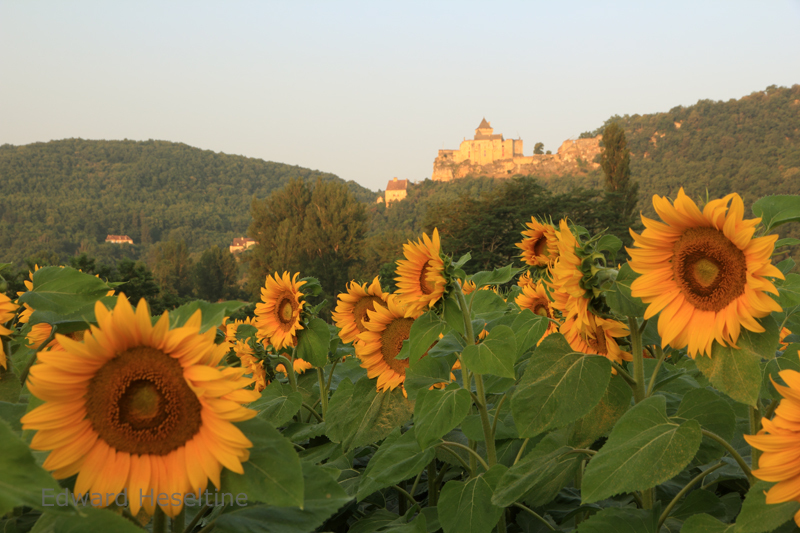 However, the focus point in the middle of the frame and not on the nearest sunflower is a bit of an error and the middle of the frame isn’t showing too many stalks and not enough flowers. 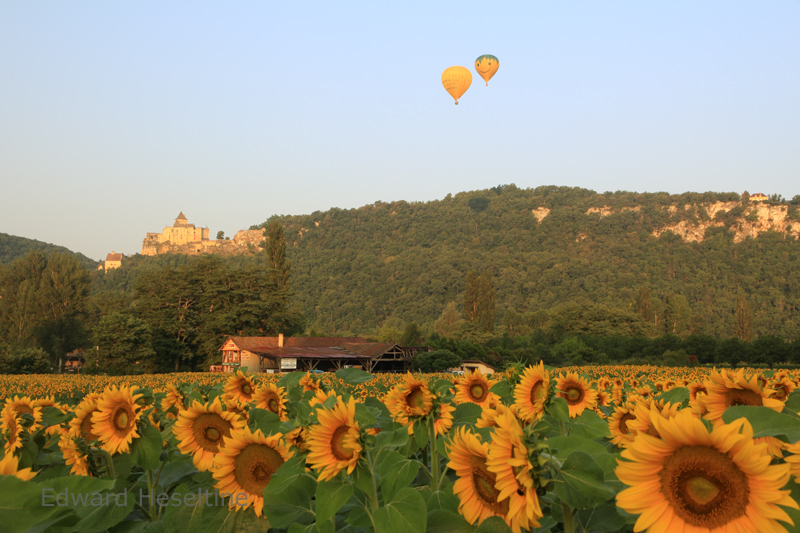 As I moved the camera again to address the compositional issues above, I had the fortune of two hot air balloons from Montgolfieres du Périgord floating towards the chateau. Getting quickly into my new position, I was able to take the following image, that I absolutely love. The flower head provides a brilliant focal point for the eye in the bottom left, the others, slightly blurred, in the bottom right provide balance at the bottom of the frame. 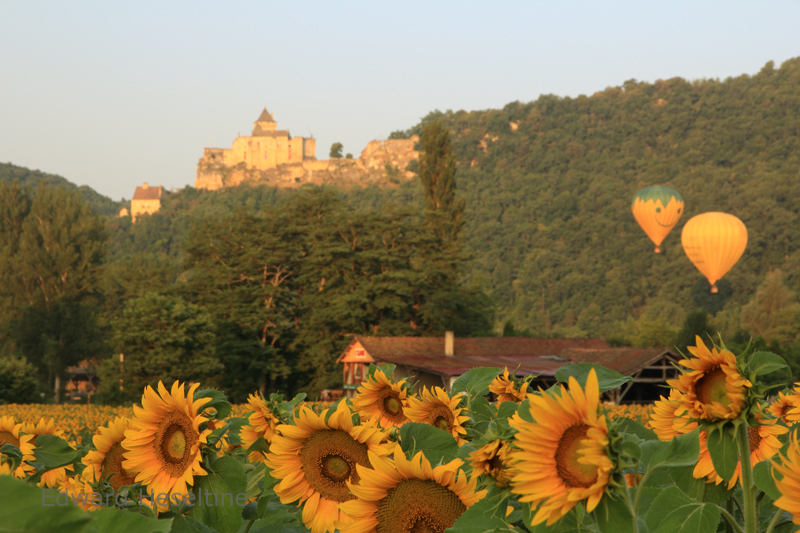 The two elements at the top of the frame, the chateau and the hot air balloon, are perfectly positioned and still recognisable despite the lens bokeh. 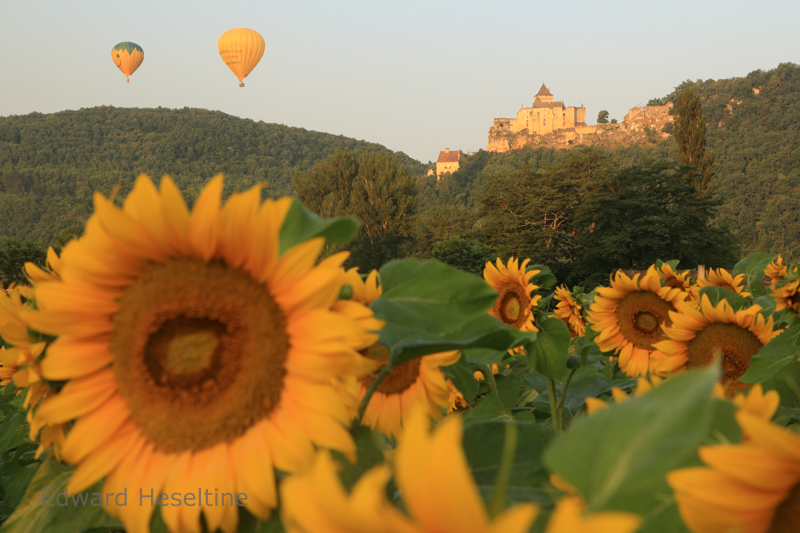 For the next image, the second balloon had come into the frame and I reversed the focal point, making the background the sharpest area of interest and allowing the flowers to blur into general foreground interest. I also like this image a lot. As the balloons continued to make their way across the frame, I managed the following sequence of images but none quite matches up to the beauty of the two above. What’s your opinion? Which one would be your favourite image? 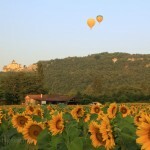 Do you have any early morning landscapes (in France or elsewhere) that you’re particularly proud of? Feel free to let me know using the comments below.